A float in a KKK parade in Bellingham, WA in 1926. The float was barred from the city's Tulip Festival, but Whatcom County continued to be a strong base of support for the State KKK through the 1920s. Photo courtesy of the Whatcom County Historical Society. 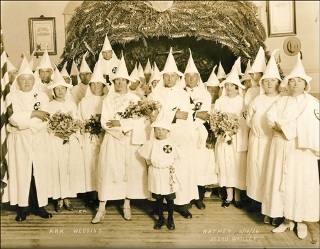 "KKK Wedding" in Sedro Wooley, Washington, June 16, 1926. Photo courtesy of the Skagit River Journal. A forty-foot electric cross displayed at a KKK rally outside Seattle in 1923. Photo courtesy of the Washington State Historical Society. Ku Klux Klan Gathering, Crystal Pool (2nd and Lenora) in Downtown Seattle, WA. March 23, 1923. Photo courtesy of the Washington State Historical Society. This special section of the Seattle Civil Rights & Labor History Project documents the history of Washington State’s 1920s chapter of the most infamous white supremacist organization in American history, the Ku Klux Klan (KKK). The second KKK was a mass movement that invoked the memory of and built upon the first KKK, which was a terrorist organization founded by white supremacists in the U.S. South. The first KKK’s violent “night riding”– in which hooded vigilantes used lynchings, whippings, and torture to intimidate recently freed slaves and their white allies – played a crucial role in the disenfranchisement of African Americans at the end of the Civil War in the 1860s and 1870s and laid a foundation for the rise of Jim Crow segregation in the 1890s and 1900s. The second KKK also helped train some of the leaders who later formed the third KKK, a mainly Southern organization that rose up in the decades after World War II to murder and terrorize people in African-American communities, particularly civil rights movement activists. 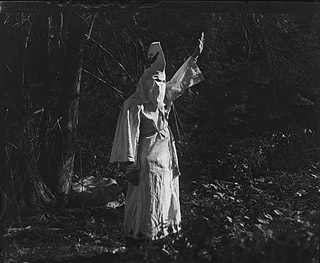 Klan members’ hoods, white robes, and burning crosses made them icons of American white supremacy and terrorism, and their legacy haunts us to this day. This special section on the KKK was created by Trevor Griffey and includes an online short book on the History of the KKK in Washington State by Trevor Griffey and article length essays by Brianne Cooke and Kristin Dimick. It presents dozens of rare photographs, newspaper articles, and documents thanks to gracious contributions from the Washington State Archives, the Washington State Historical Society, the Whatcom County Historical Society, and the Skagit River Journal. 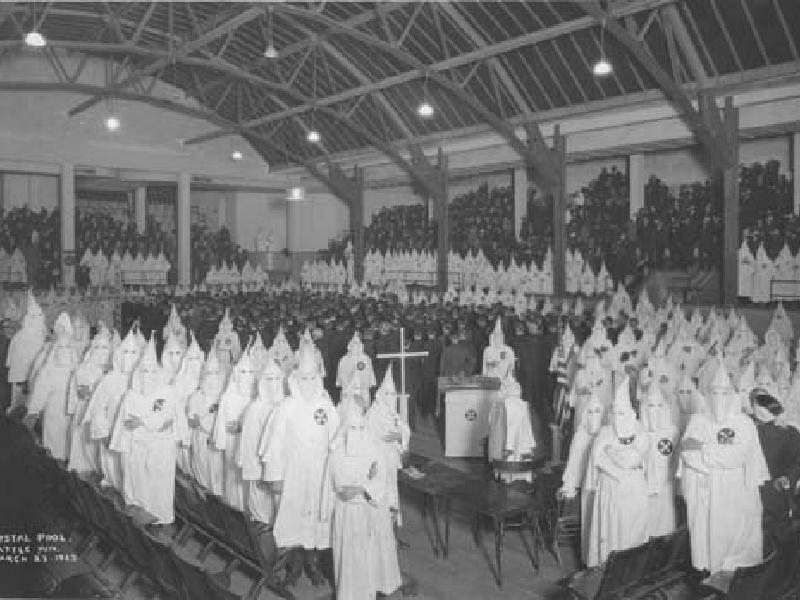 History of the KKK in Washington State , By Trevor Griffey The Washington State Klan had a meteoric rise and fall in the 1920s. 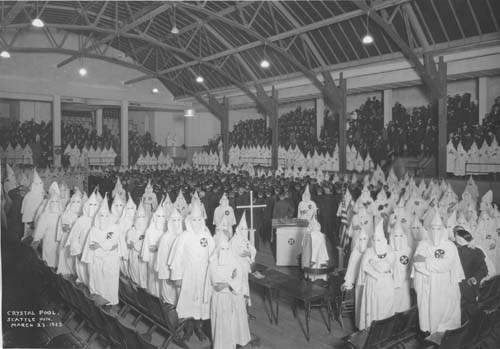 The organization’s history shows how the Klan skillfully used spectacular mass meetings to gain members and influence public opinion. The Ku Klux Klan and the Anti-Catholic School Bills of Washington and Oregon, By Kristin Dimick The Oregon State Klan led a successful campaign in 1923 that made private schools illegal. In 1924, the Washington State Klan tried to duplicate this anti-Catholic campaign but voters rejected the initiative 2-1. 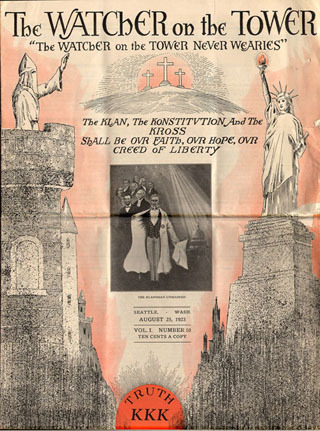 Washington KKK Newspaper: The Watcher on the Tower, By Brianne Cooke From 1923 to 1924, the Washington State Klan published a newspaper out of Seattle called The Watcher on the Tower. Its propaganda shows how white supremacists in the Pacific Northwest promoted an organization associated with the U.S. South. Photographs: Rare photos courtesy of the Washington State Historical Society, the Skagit River Journal, and the Whatcom County Historical Society. Documents: Rare letters and telegrams to Governor Louis Hart regarding the Klan. Courtesy of Washington State Archives; Clippings from regional newspapers in Whatcom, King, and Thurston counties about Klan activities; and clippings regarding the Klan-supported anti-Catholic Initiative 49, which failed in 1924. The Watcher on the Tower: Selected 1923 clippings from the Washington State Klan’s weekly newspaper.